Federal Hall is one of the most distinguished places in American history. 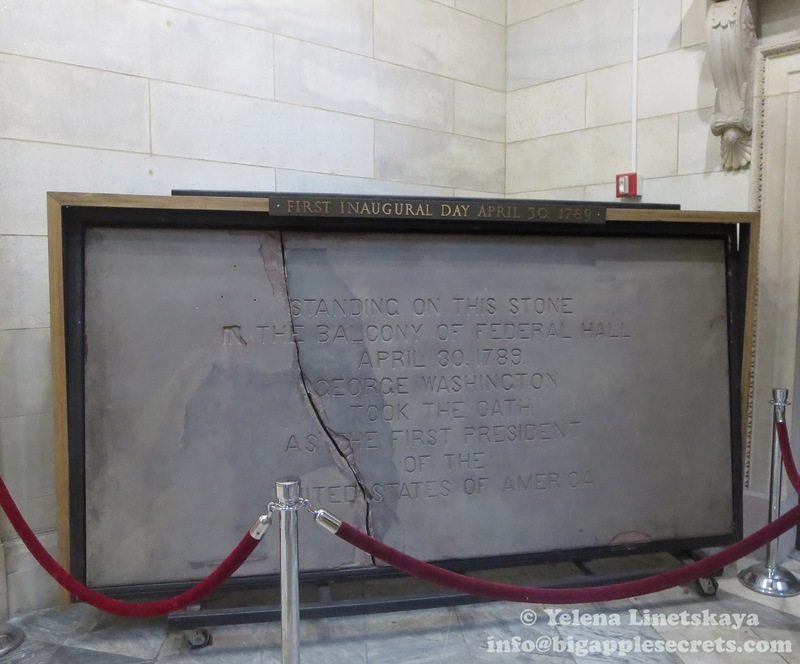 It has been the site of government activity for more than 300 years. 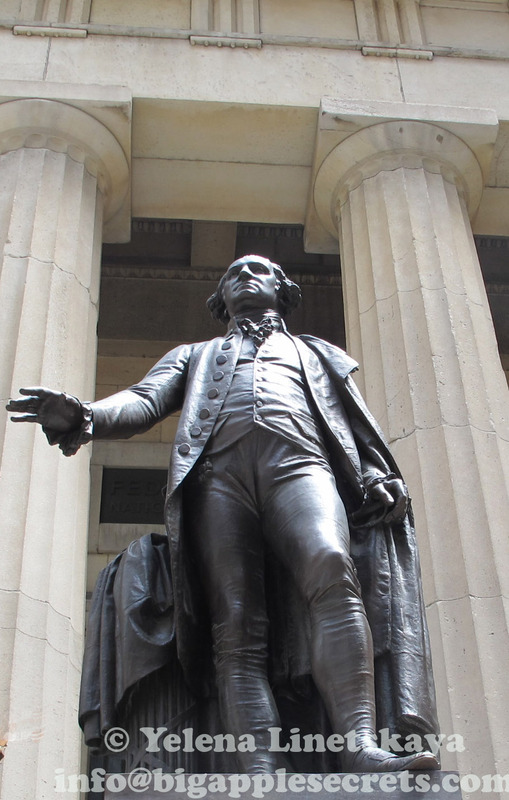 Here on Wall Street, George Washington took the oath of office as our first President, and this site was home to the first Congress, Supreme Court, and Executive Branch offices. 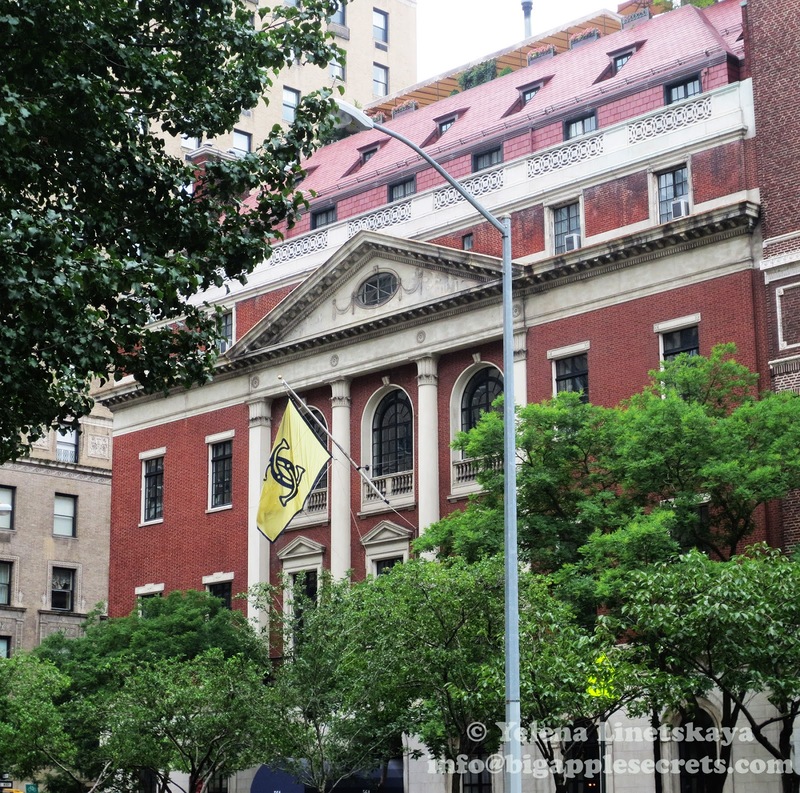 The first building on this site was built in 1700 as New York's City Hall. In October 1765 the Stamp Act Congress met in this building. Congress was the first colonial action against a British measure and was formed to protest the Stamp Act issued by British Parliament on March 1765. The Stamp Act 1765 was an act of the Parliament of Great Britain that imposed a direct tax on the colonies of British America. It required that many printed materials in the colonies, such as legal documents, magazines, playing cards, newspapers, should be printed on stamped paper produced in London, carrying an embossed revenue stamp. The stamp tax had to be paid in valid British currency, not in colonial paper money. British government invented the doctrine of "virtual representation" in attempt to legitimize the policies of the Stamp Act. Many Colonists saw it as a direct violation of their rights. Virtual representation was wholly rejected in the colonies, who said the "virtual" was a cover for political corruption. There were 27 representatives of nine of the thirteen colonies (that eventually formed the United States of America ) attending congress. On October 19, 1765 the Stamp Act Congress adopted a Declaration of Rights and Grievances, which stated among other things that only the colonial assemblies had a right to tax the colonies. 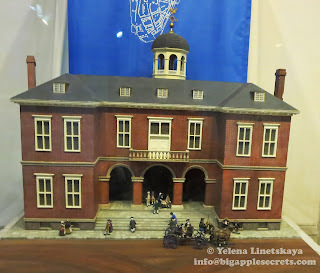 After the American Revolution, the City Hall served as the meeting place for the Congress of the United States under the Articles of Confederation, from 1785 until 1789. After the new federal government was launched with the 1788 ratification of the U.S. Constitution in 1789 New York City became the nation's first capital and the building was renamed Federal Hall. Hoping to convince the new Congress to make New York the capital local businessmen contributed funding for a major expansion of the city hall. In 1788, the building was remodeled and enlarged under the direction of Pierre Charles L'Enfant, who was later selected by President George Washington to design the capital city on the Potomac River. On April 14, 1789, at Mount Vernon Washington received official notification that he had been unanimously selected by the Electoral College to be the nation's first president. 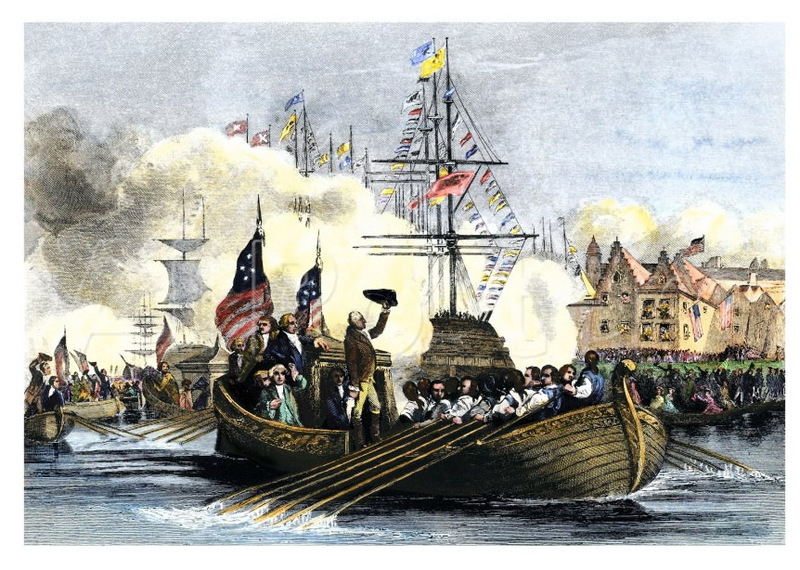 In ten days Washington arrived in smaller barge to New York, where he was greeted by New York Governor and citizens. Rudolph Von Dorsten was the Secretary of the Dutch Legation in New York City and describes Washington's entrance into the city: "President George Washington made his entry into New York on Thursday, April 23d. On the previous day a barge left this city. 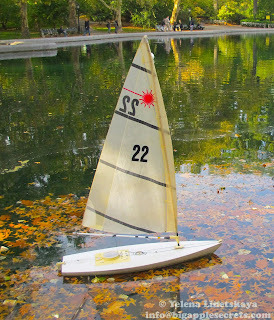 The barge was built expressly by the citizens of New York, and was rowed by thirteen pilots, all dressed in white. 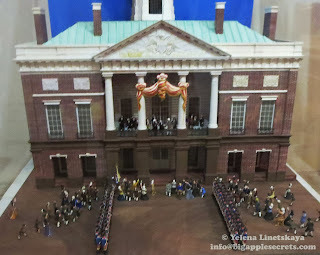 A committee of three Senators and five Representatives on behalf of Congress, and three of the first officers on behalf of New York, went to Elizabethtown in New Jersey, to welcome the President, and to await his arrival there. 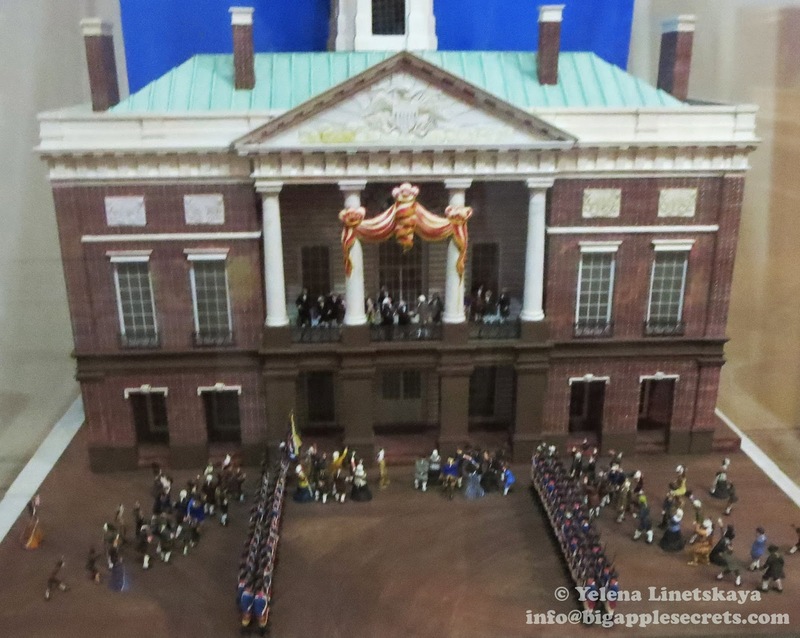 His Excellency was also accompanied by some well-equipped sloops and by a multitude of small craft with citizens of New Jersey and New York on board"
On April 30, 1789, the inaugural ceremony took place on the balcony of Federal Hall. Although the Constitution does not require it, most presidents have sworn the oath of office with their right or left hands placed upon a Bible. George Washington was Mason. 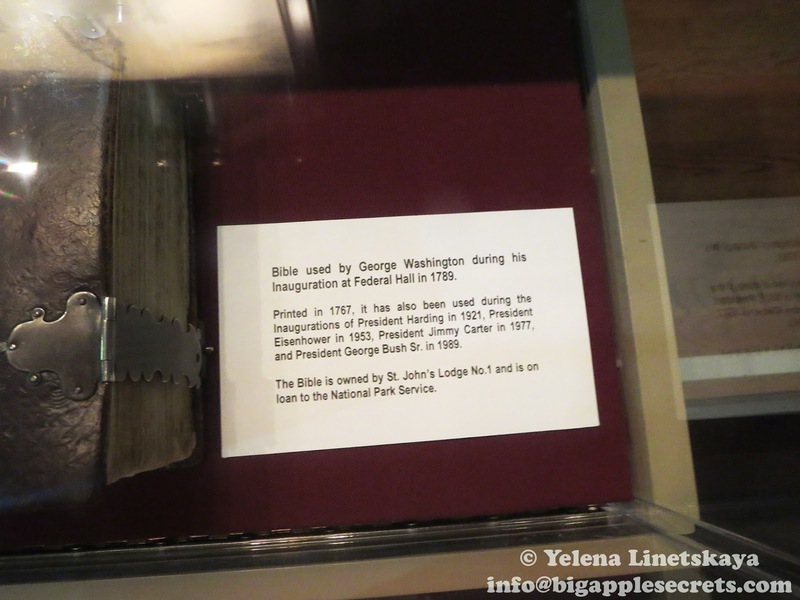 The Bible used for the inaugural oath, printed in 1767, was the Altar Bible of St. John's Masonic Lodge, No. 1. Presidents George H.W. 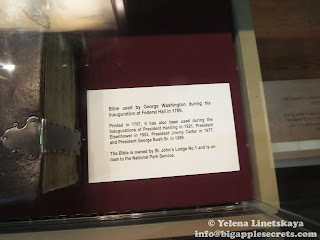 Bush, Carter, Eisenhower, and Harding also used the same Bible when they were inaugurated. St. John's Lodge No.1 is the oldest operating Masonic Lodge under the jurisdiction of the Grand Lodge of New York F&AM. 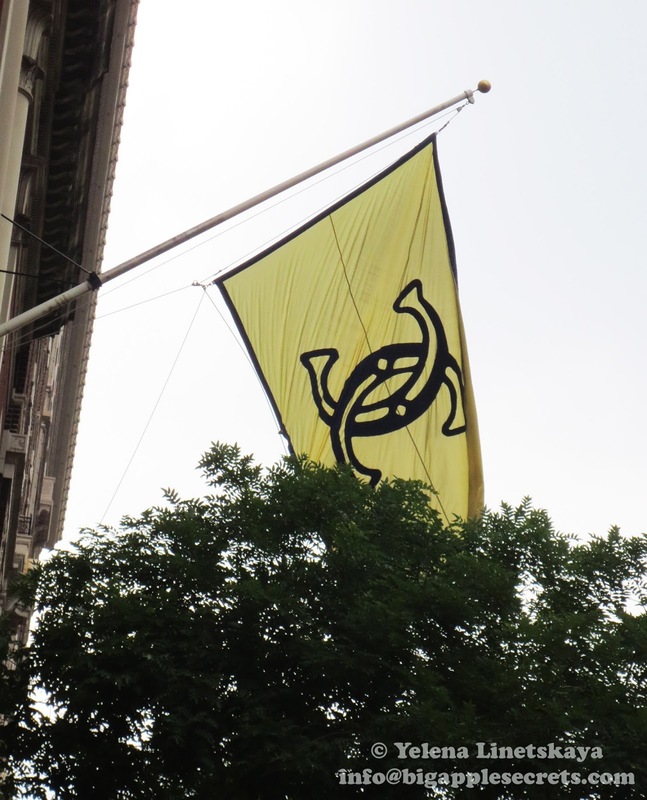 The Lodge is active and have meetings every month on third Thursday between September and May on the 6th floor of Masonic Hall in Manhattan. In 1790 the United States capital was moved to Philadelphia and the building once again housed the government of New York City until 1812. Later the building was abandoned , razed and the polished marble mantles, crimson draperies and other remnants sold for $425. The present building is named in honor of that earlier structure. 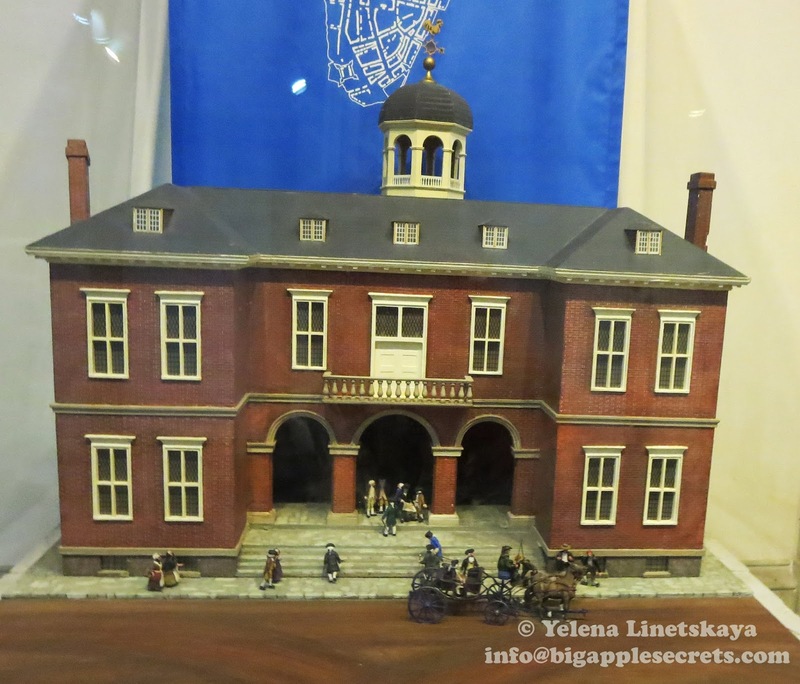 It was constructed in 1842 as a first Customs House. It took more than a decade to complete the building. Twenty years later in 1862, Customs moved to 55 Wall Street and the building served as one of six United States Sub-Treasury locations. 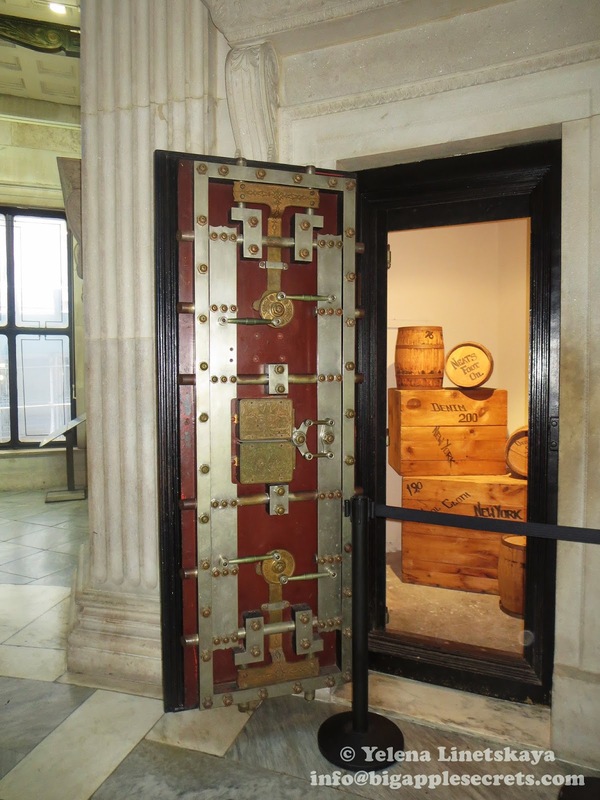 Federal Hall's subbasement was reinforced with steel. At one point there were 1,178 tons of gold and silver stored here. 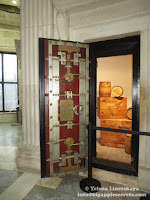 Millions of dollars of gold and silver were kept in the basement vaults until the Federal Reserve Bank replaced the Sub-Treasury system in 1920. 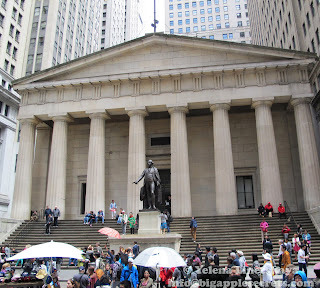 There is a huge statue of General Washington in front of the redesigned Federal Hall. The statue was unveiled in 1883 to commemorate Washington's 1789 inauguration in the building. It was done by American sculptor John Quincy Adams Ward. 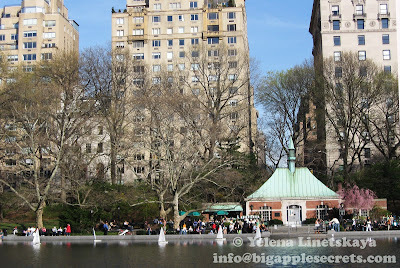 There are several other statues by Ward in New York- four of them are in the Central Park and one ( high relief) - across the street from the Washington Statue. The 110 ft. wide pediment of New York Stock Exchange contains eleven figures, including figures symbolizing Science, Industry, Agriculture, Mining, and a figure that represents "Realizing Intelligence." The building today houses a very small museum. Park rangers inside help to answer questions. 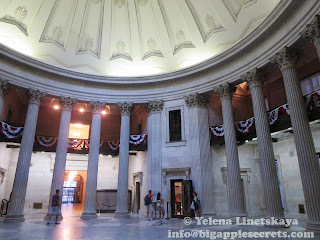 Federal Hall a nice place to visit for 30 minutes if you have interest in early American history. The hall is open Monday-Saturday, 9am-5pm. It is free and there are restrooms inside. New York has a long tradition of private clubs that are designed to keep outsiders at bay. Each different club may appeal more to artists, or authors, or politicians, or city planners, depending on their charters. Hone Club was the greatest dinner-giving club for upper class merchants, James Fenimore Cooper founded Bread and Cheese Club (which was not devoted to food, but rather literary pursuits), the City Club was described as an “anti-bad-city government club”. All of these clubs shared one feature: they were only for men! The only club that was created only for women is The Colony Club. The Club was founded in 1903 by Florence Harriman(1870-1967) , American socialite. Florence was remarkable woman. She participated in the Versailles Peace Conference, was appointed the United States Minister to Norway by FDR in 1937, led one of the suffrage parades down Fifth Avenue. Harriman wrote one of the first publications on the Holocaust and Auschwitz Concentration Camp, “Oswiecim, Camp of Death,” published in March 1944 before the camp's liberation by Soviet troops. At age 84 Florence led a parade in Washington DC to protest “taxation without participation". U.S. President John F. Kennedy honored her by awarding her the first “Citation of Merit for Distinguished Service.” She often found herself in the middle of historic events. As she stated, “I think nobody can deny that I have always had through sheer luck a box seat at the America of my times". 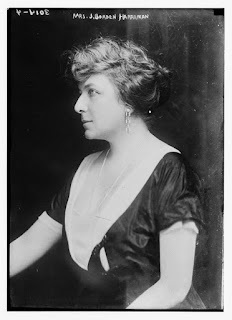 The club's treasurer, Anne Morgan, who was also interested in social reforms, was sometimes referred to as the richest woman in the world -- her father was J. Pierpont Morgan. The founding members established an initiation fee of $150 and annual dues at $100, which put the Colony Club on the level of the most expensive men’s club. Members were also asked for contributions to finance construction of the clubhouse. J. P. Morgan, whose three daughters were all members, agreed to subscribe $10,000 if nine other men would do the same. The New York Times published a complete membership roster on the first anniversary, which included four Vanderbilts, four Whitneys, the three daughters of J. P. Morgan and Mrs. John Jacob Astor. The Colony Club served as an athletic facility for its members. It featured a gymnasium, a pool, a running track, and other standard athletic facilities for the benefit of its members. When the club opened, the key difficulty proved to be the liquor license. A law prohibiting liquor licenses within 200 feet of a church without the church’s permission. The first club first facility was erected on Madison Avenue at 29th Street, across the street from Madison Avenue Baptist Church. The club was not able to get a liquor license until it moved north to its larger quarters on Park Avenue . 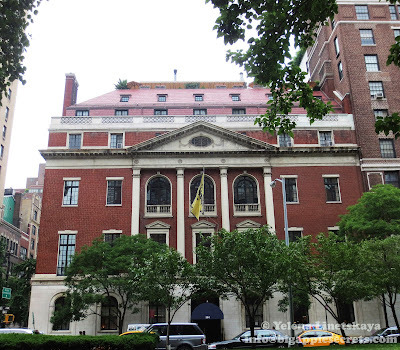 The second clubhouse, located at 564 Park Avenue, was constructed from 1914 to 1916. The 80,000 square foot clubhouse has seven stories and includes 25 guest bedrooms, three dining rooms, two ballrooms, a lounge, a squash court, an indoor pool, a fitness facility and three personal spa service rooms. The Club currently has 2,500 members. Dress code is very strict. Appropriate clothing for ladies includes suits, dresses, skirts, tailored slacks, blouses and sweaters. Jeans and denim apparel of any color or other “five-pocket style” pants are strictly prohibited. Forget about casual Capri and cargo pants, shorts and T-shirts. Gentlemen must wear jackets, collared shirts and ties. Men may enter the Clubhouse without wearing ties only during the summer when dining on the Roof Terrace. Today, men are allowed in the restaurants and the pool. The club has its' own squash court and squash instructor who gives daily lessons to members, their families and guests. The club continues its policy of women-only membership – new members must be recommended by current members. 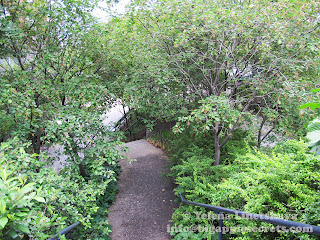 I came across Teardrop Park a couple weeks ago while walking along the beautiful Esplanade , that runs the entire length of Battery Park City. 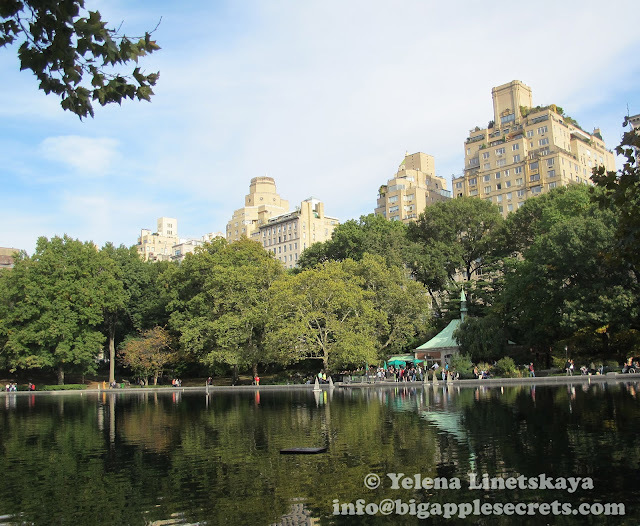 The trees all along the Esplanade make you forget you're in the city that never sleeps. 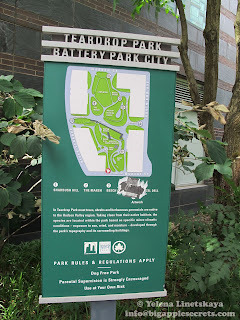 It is impossible to imagine but 50 years ago there was no Battery Park City at all. This 92-acre plot of land wasn't even imagined until the 1960s. 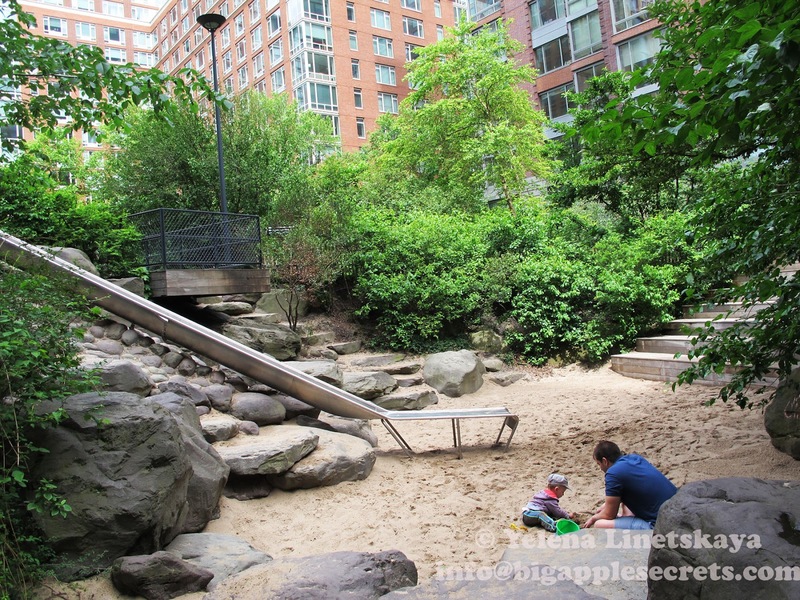 Battery Park City is a neighborhood created from scratch. The area now known as Battery Park City was once filled with busy piers as part of the Port of New York. When the rise of air travel made the port obsolete, the piers were abandoned and began to deteriorate. In 1966 Governor Nelson Rockefeller announced a plan he created with private firms for a landfill to restore the area . The rundown piers left by the Port of New York were demolished and land was created using clean fill from excavation of the World Trade Center site, among other places. 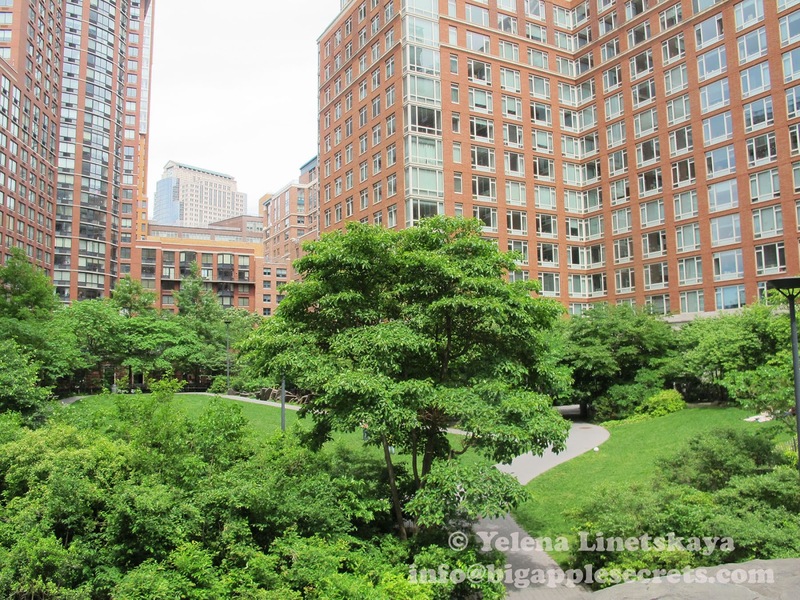 Teardrop Park is a public park that sits between four residential buildings, each ranging from 210 feet to 235 feet in height, close to Nelson Rockefeller Park and five minutes by foot from World Financial Center. 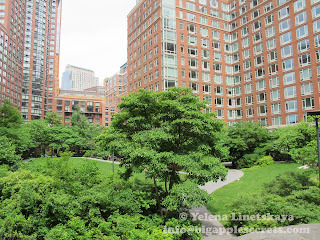 When you walk into Battery Park City, you see rows of tall apartment buildings. 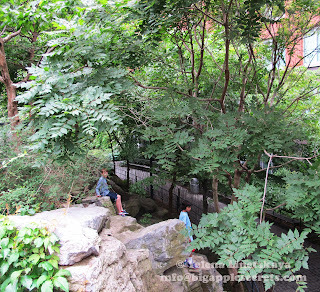 But if you walk behind the building 22 River Terrace, there’s a cluster of big trees- this is the park. 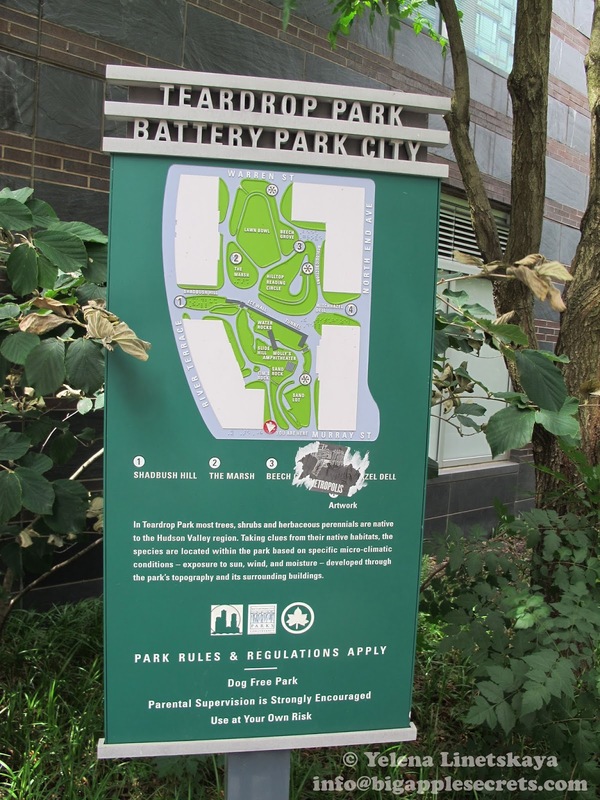 Park was designed by landscape architect group Michael Van Valkenburgh Associates and completed 2006 at a 17 million dollar budget. 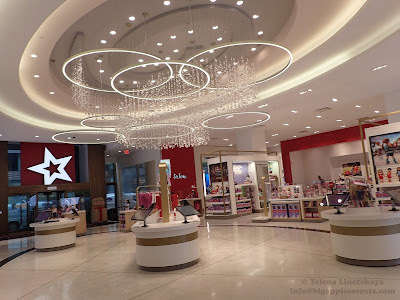 Michael Van Valkenburgh Associates principal Matthew Ubanski stated, “We needed a strategy that allowed for some sense of exploration or unfolding in this very small space. Otherwise people would just come in, see everything, and leave". 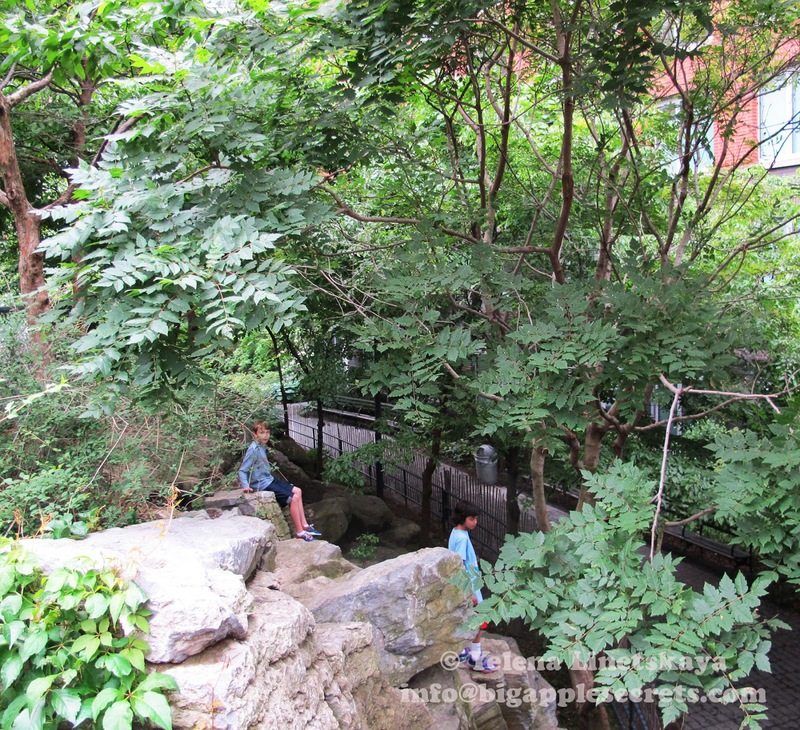 It feel like you are in the middle of a forest, and the 14-foot-tall slide feels surprisingly steep. There is also a huge sandbox , splashy fountains and a water playground in the park. The park is very eco-friendly. Treated and recycled water from the adjacent LEED Gold-rated Solaire Building and storm water runoff from the site are captured in an underground storage pipe, supplying all of the park’s irrigation needs. 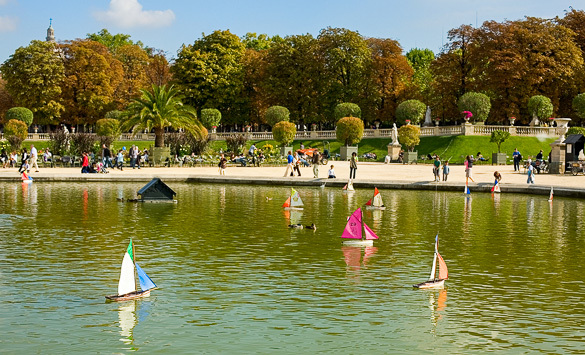 The environmental aspects of the park’s design include fully organic soils and maintenance regimes that don’t rely on pesticides, herbicides, or fungicides. The southern part of the park was lighted by three huge 8-foot-diameter solar mirrors installed on the top of a residential apartment building. 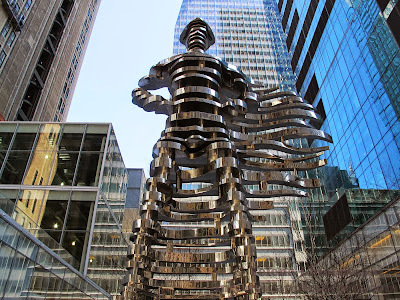 The Guardians: Hero and Superhero by Italian architect and designer Antonio Pio Saracino are two public sculptures at gateway to Bryant Park. 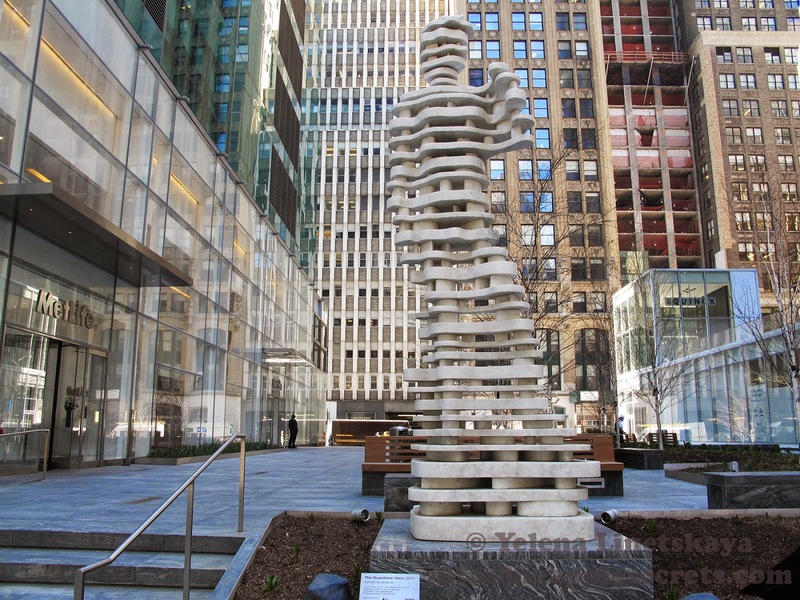 These statues, one in marble and the other in mirror-polished stainless steel, are located at the north and south ends of the public plaza at Three Bryant Park between 41st and 42nd Streets . 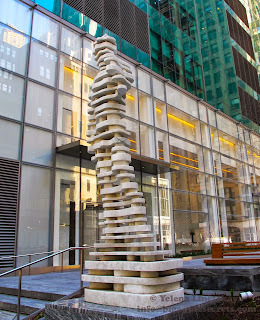 Saracino is an Italian-born architect and designer based in New York City. Over the past ten years, he’s exhibited in galleries and museums throughout Europe, the Middle East, North and South America, and Australia. In 2013, New York’s Museum of Arts and Design featured Saracino’s work in the exhibition “Out of Hand: Materializing the Postdigital" at MAD museum near Colambus circle.I wrote about this exhibitoin in one of myposts. Also in 2013, in New York, Saracino designed The Guardians: Hero and Superhero, two 13-foot-tall sculptures, one in marble, the other in stainless steel, which sit at the entrance to Midtown Manhattan’s Bryant Park. 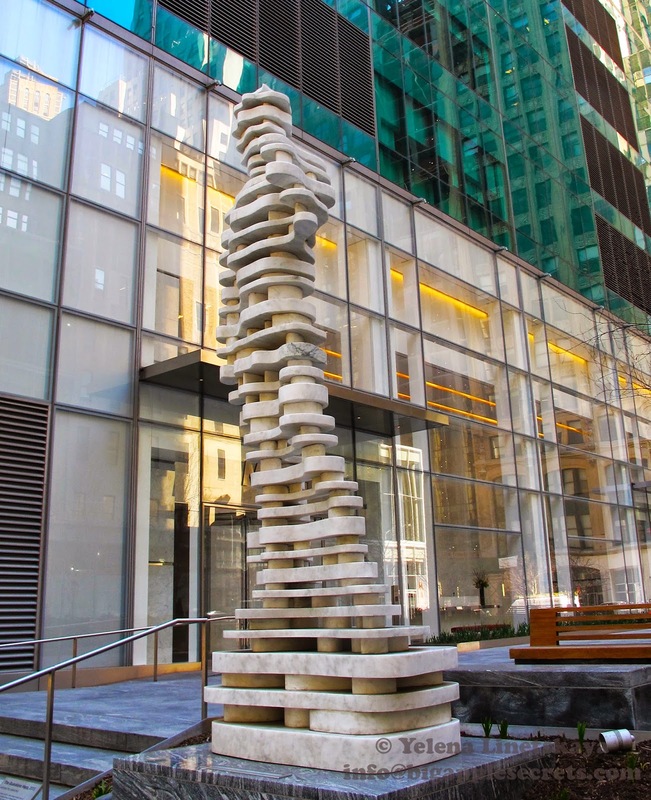 Hero, made in New York of 8,000 pounds of marble, watches over uptown Manhattan. The 13-foot statue updates Michaelangelo’s David, historical defender of Florence, as a defender of New York City. White marble slates of the statue came from the largest quarry in the world, located in Danby, Vermont, whose general manager and owner come from Carrara (Italy), as do many of its workers and much of its equipment. The slates were then brought to New York’s ABC Stone company to be cut and assembled as per the instructions given by Saracino, who was assisted by structural engineers from the New York-based Experion Design Group. 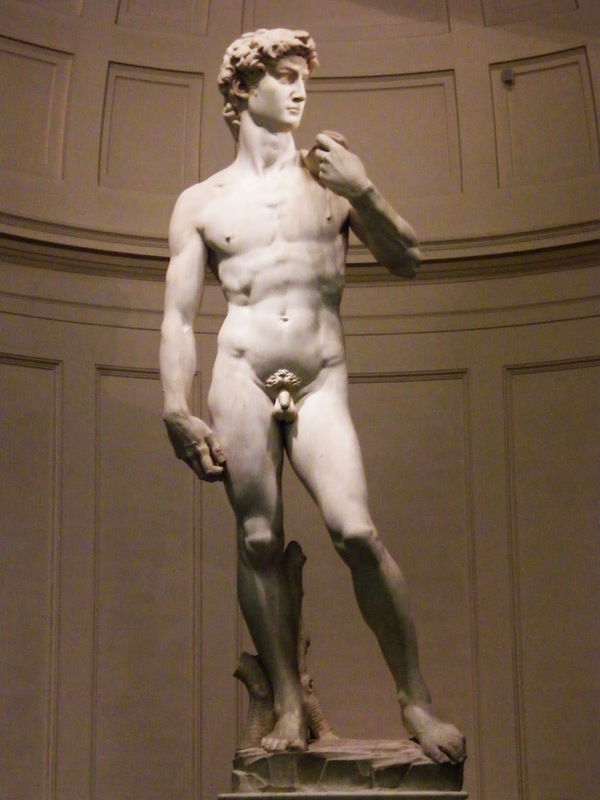 This statue has been included in the 2014 exhibition in the Gallery of the Academy of Florence, honoring the 450th anniversary of Michelangelo’s death. Hero is a Gift from the Italian Government to the U.S. The ambassador of Italy to the United States, Claudio Bisogniero, stated: “David: such a strong symbol of Italian cultural heritage, and now a Guardian of the friendship between our two countries". Saracino, interviewed on the day of the installation in the plaza, said: “I was asked by the Italian Embassy to look at Michelangelo’s David for inspiration. Clearly such a momentous reference was daunting. Yet I was so proud to be able to create a symbol that could represent a gift from my native Italy to New York, that I accepted the extraordinary challenge”. FIGMENT is a completely free annual festival of participatory art and culture taking place in multiple cities across the globe. 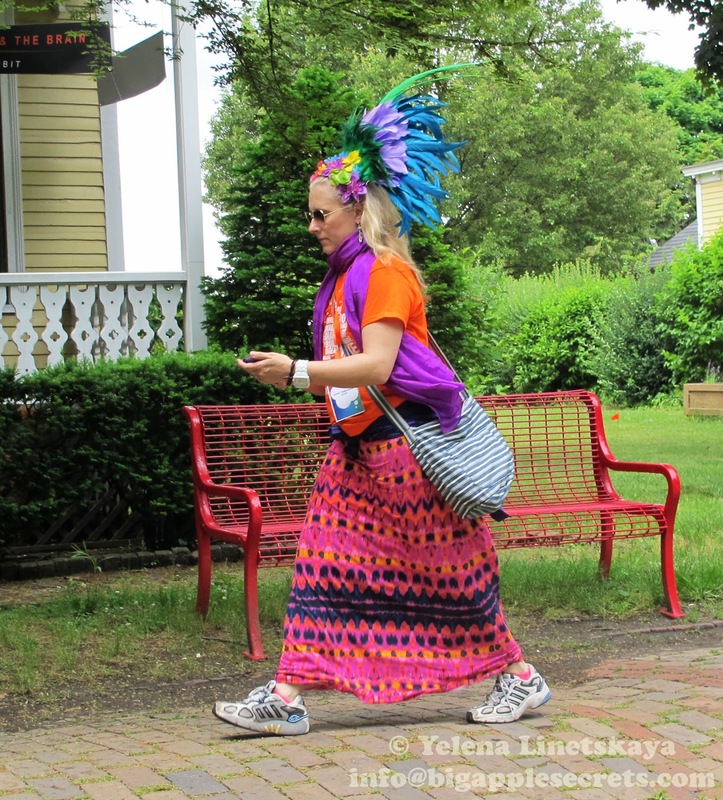 FIGMENT’s annual event began in New York on Governors Island in 2007. At the time that FIGMENT began, Governors Island was a new public venue that had recently (2003) been turned over from the Federal Government to New York City, with a very specific set of restrictions: there could be no permanent housing on the island, no casinos for 50 years, and significant portions of the island had to be used for educational and cultural purposes. 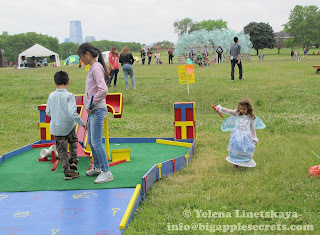 Governors Island is located 800 yards from the southern tip of Manhattan Island. 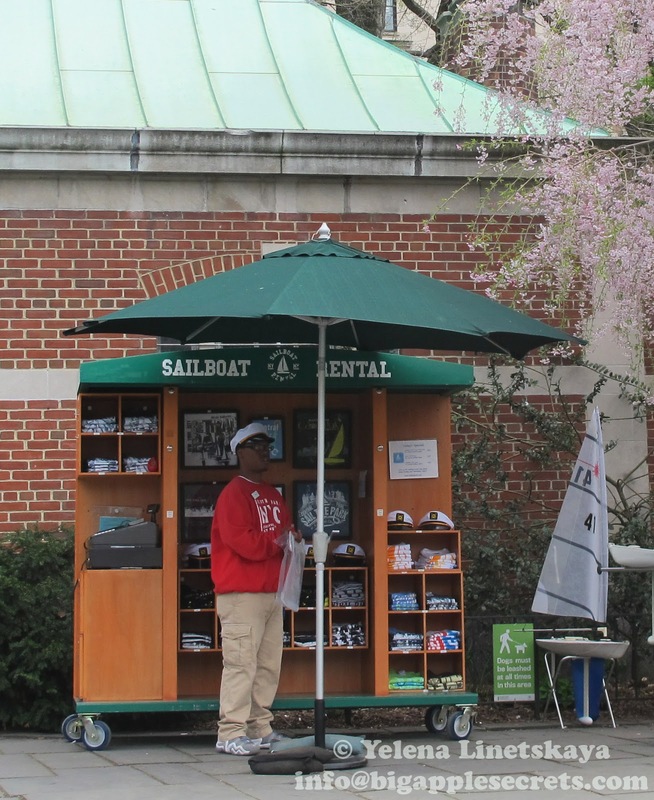 For almost two centuries, Governors Island was a military base. 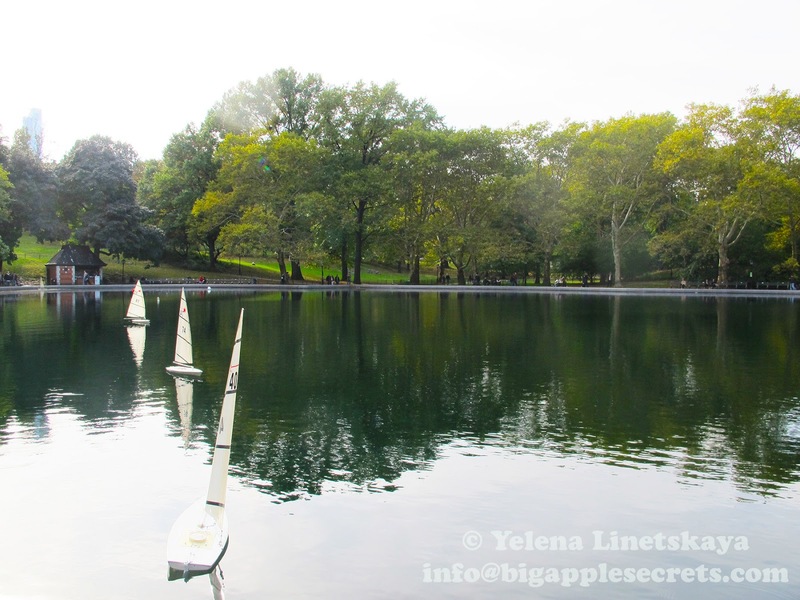 In 2003 the federal government sold 150 acres of Island to the people of New York. 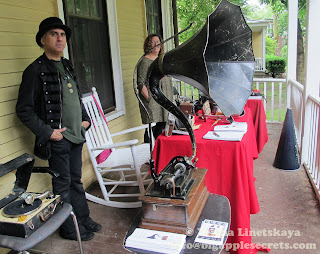 You can read about the island in one of my posts . 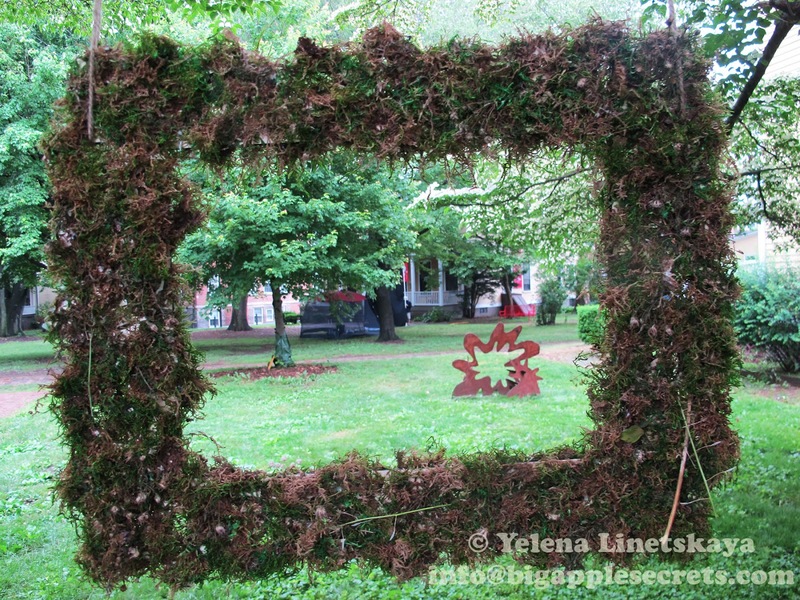 Staring from 2007 each summer, FIGMENT NYC transforms Governors Island into a large-scale collaborative artwork. 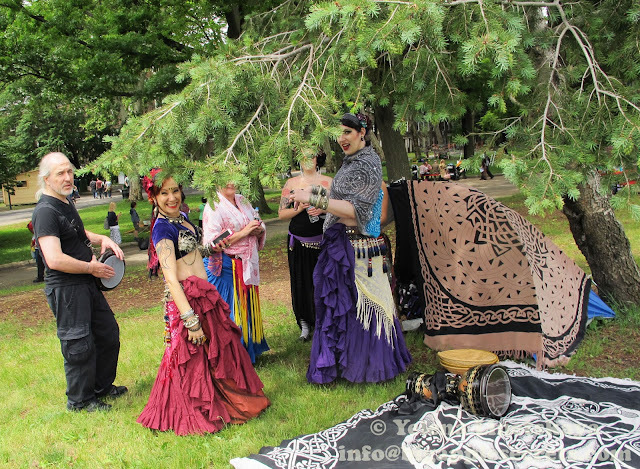 FIGMENT is an annual arts event with artwork in every medium, from installation to performance to music to games and many things in between . For one weekend each summer FIGMENT transforms Governors Island into a large-scale collaborative artwork - and then it's gone. FIGMENT is based on 11 principles including participation, inclusion, decommodification and leave no trace. FIGMENT does not sell anything on the Island, and does not allow commerce of any kind. 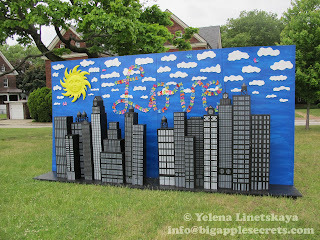 There are two big installations on the Parade Grounds. One is the Billion Oyster Pavilion by the Long Island City, which partners with the Governors Island Alliance to restore one billion live oysters to the New York Harbor. 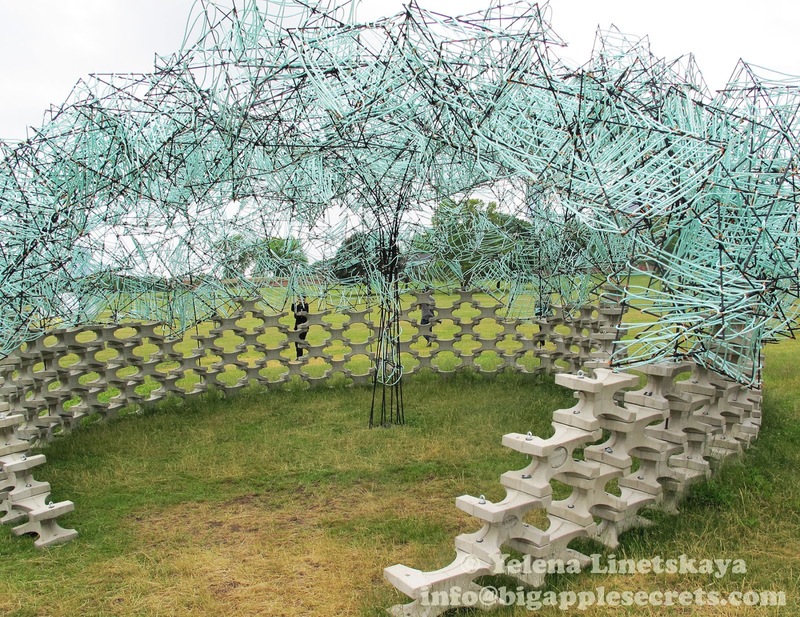 The pavilion’s woven canopy is made of steel rebar, nylon rope, and hose clamps. Another is The Organic Growth Pavilion, inspired by flowers that can actively respond to the natural environment—like hydrangeas. 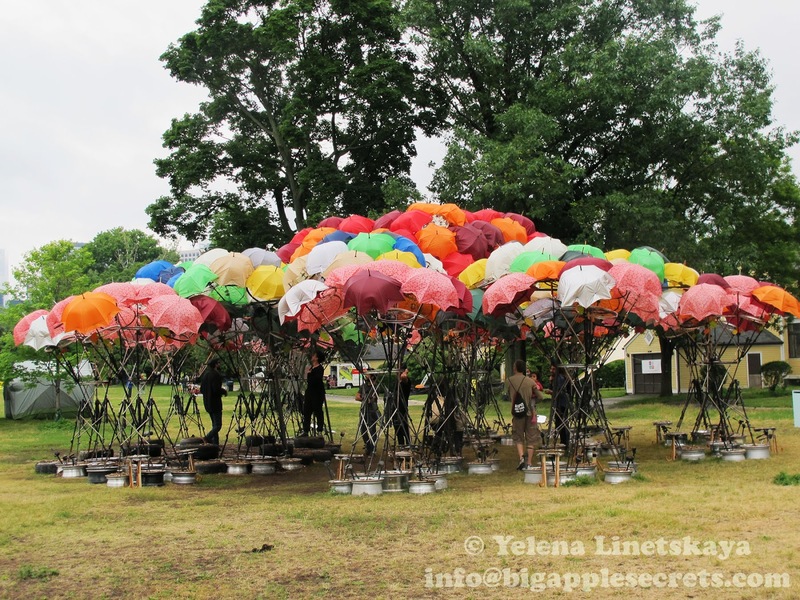 To replicate that type of responsiveness, artists uses broken objects like umbrellas, stools, and bicycle wheels and crafts them into flower-like structures. 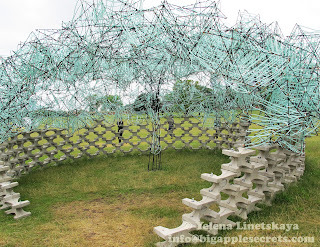 As with the Billion Oyster Pavilion, the materials used in Organic Growth can be reused after the pavilion is dismantled. The designers envision the broken umbrellas and larger elements from the pavilion as sun and shade protection devices for public spaces in New York or as decorative chandeliers. There are several projects this year that I really like. One of them is imaginary Japanese game show where you dress up and battle in kiddy pools with super soaked plush toys. 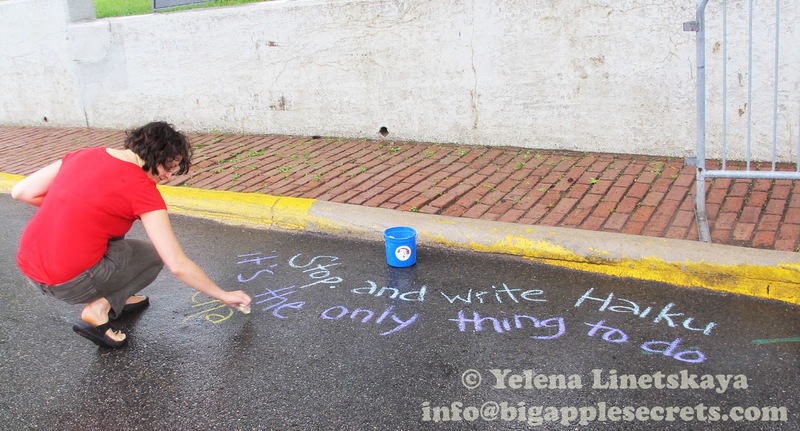 Another one is The Love Yourself Project . Project leaders believe that with a strong relationship to the self, every individual can contribute to a future with loving regard for all living beings and the environment. 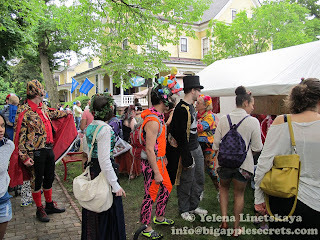 There is a tent with free carnival costumes for kids and adults and a lot of activity for kids. There is also a place where you can experience some music from an actual Thomas Edison Cylinder phonograph from over 100 years ago. I visited FIGMENT today, June 6th and highly recommend the event to everybody, especially family with kids - you still have time tomorrow to go to the Governors Island ! Governors Island is open every day from May 23 – September 27 from 10AM to 6PM on weekdays and from 10 AM to 7 PM on weekends. Ferries to the island run from Lower Manhattan every day and run from Brooklyn Bridge Park’s Pier 6 on Saturdays, Sundays, Memorial Day and Labor Day. 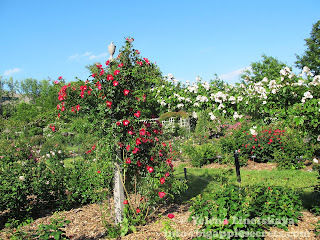 Brooklyn Botanic Garden is just several strops from Manhattan. 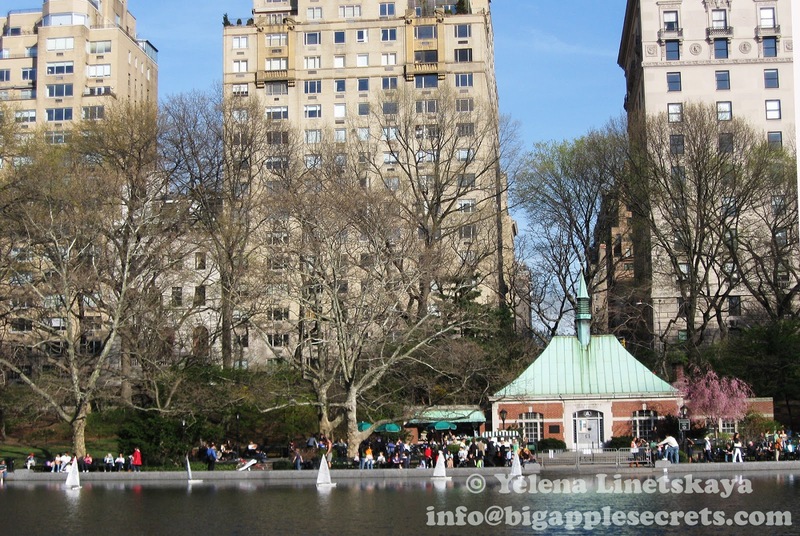 It is the best place to see the flowering magnolia trees in the beginning of the spring. The garden was founded in 1910. 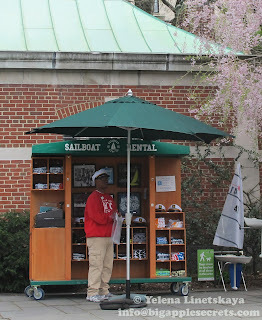 Every year there are about a million visitors from all over the world. In my previous posts I told about the garden and about its' bonsai collection. But June is a rose month! 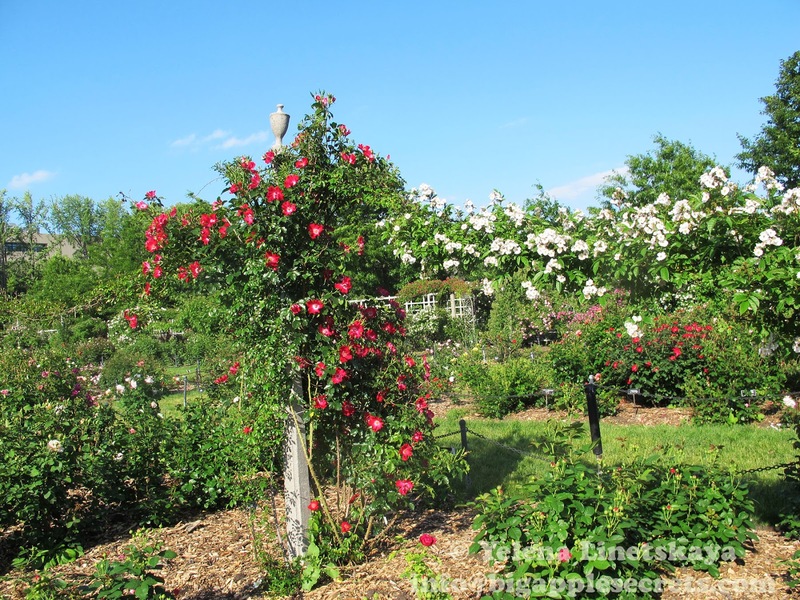 Collection of roses in Brooklyn Botanic garden is one of the largest in the country and in June roses are in full bloom. The rose (Latin, rosa, in Greek, rhodon) is a sacred symbol of regeneration, purity, virginity, fertility, sexuality, secrets, and most of all, love. It is believed that roses were grown in all the early civilizations at least 5000 years agoRose fragments have often been found inside burial tombs. In Greek mythology, the rose with five petals became the five-pointed star (pentagram or pentacle) of the Goddess of Love, Aphrodite and the red petals of the rose are the blood of Lord Adonis. The ancient Roman festival called “Rosalia” was part of the cult of the dead from the first century. In Alchemy red and white roses enter into the general red/white duality symbolizing the primer elements sulphur and mercury. 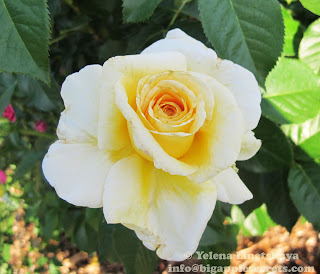 White Rose and Red Rose become first in the European history political symbol of fight for power. 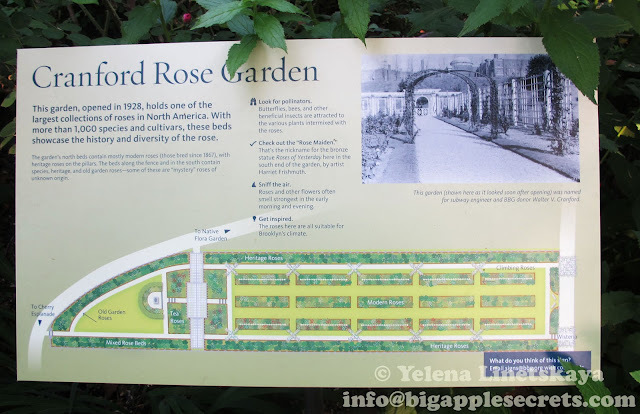 The War of Roses ended in 1485 with arise of new power - house of Tudor when Henry Tudor won the throne of England and united the red rose of Lancaster with the white rose of York. On November 20, 1986, President Ronald Reagan, signed Proclamation 5574 declaring the Rose to be The National Floral Emblem of the United States of America. Each of the 50 states has also adopted an official state flower, including the rose in New York, the Oklahoma rose in Oklahoma, the Cherokee rose in Georgia, and the wild prairie rose in Iowa and North Dakota. 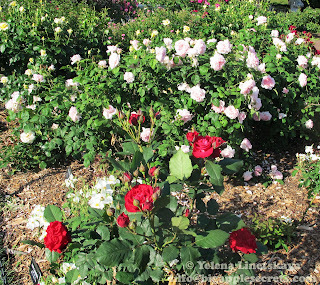 Ornamental roses have been cultivated for millennia, with the earliest known cultivation known to date from at least 500 BC in Mediterranean countries, Persia, and China. 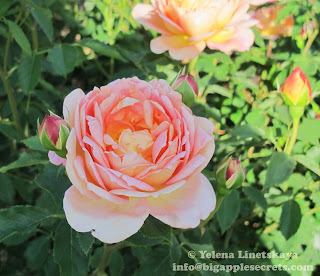 The predecessor of the modern rose garden was planted by the French empress Joséphine de Beauharnais, the wife of Napoléon Bonaparte at Château de Malmaison in the years between . 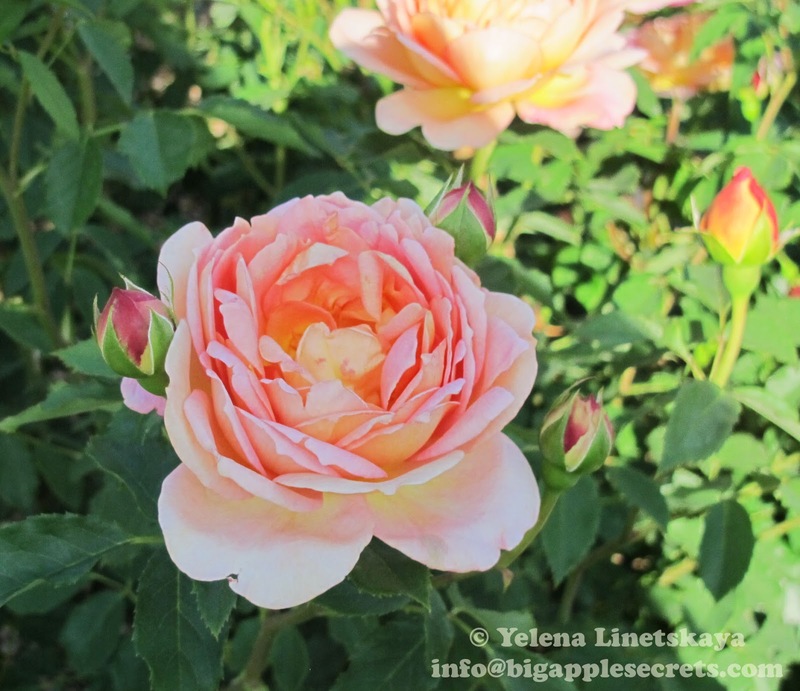 At her death in 1814, the garden included more than 250 varieties of roses. In 1927, Walter V. Cranford, a construction engineer whose firm built many of Brooklyn's subway tunnels, donated $15,000 to BBG for a rose garden. Excavation revealed an old cobblestone road two feet below the surface and tons of glacial rock, which had to be carted away on horse-drawn barges. 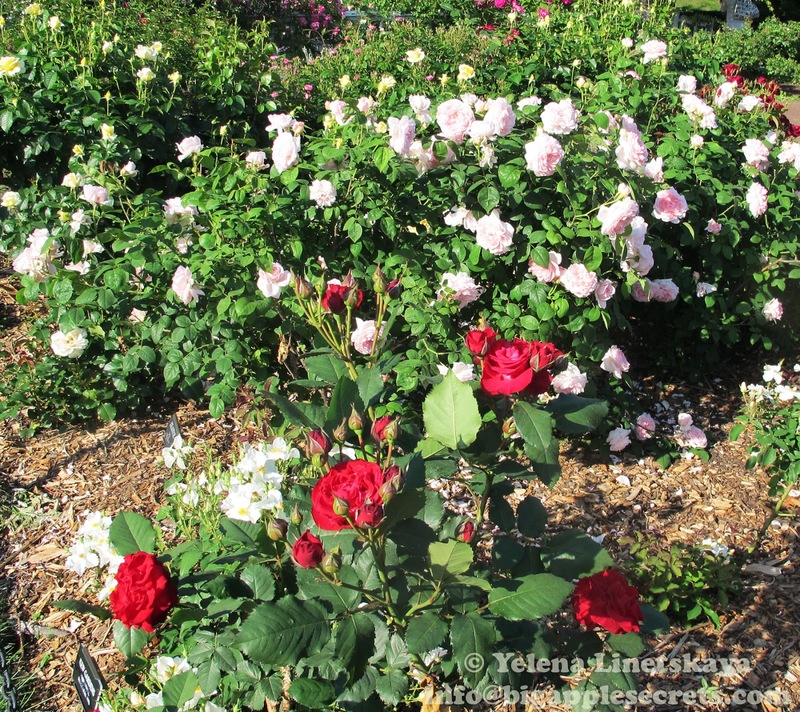 There are over 5,000 bushes of nearly 1,400 kinds of roses, including wild species, old garden roses and hybrid tea roses. 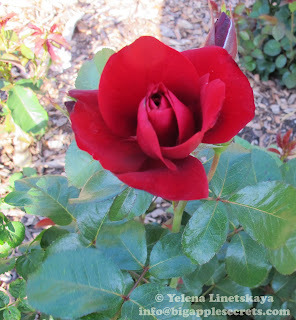 And right now the roses, of every shade from white to pink to that perfect deep red are flowering in all their glory - so now is the time to visit, before, as they say, the bloom is off the rose….